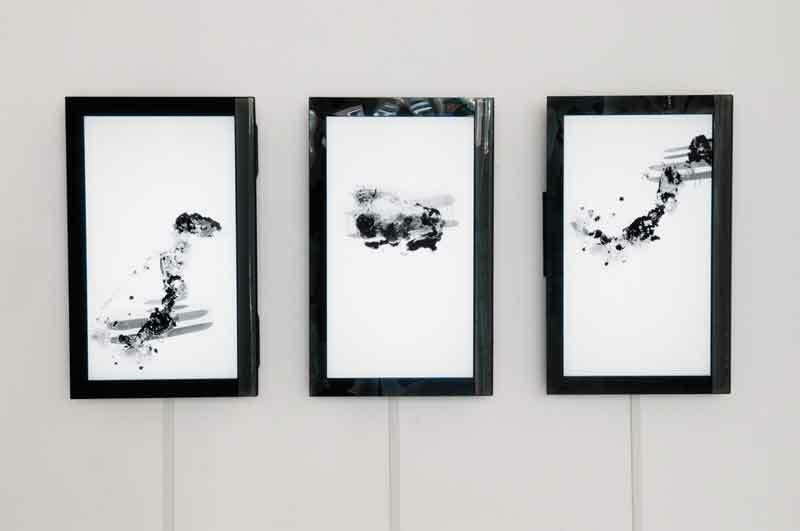 “Kinetica [movement in art]” and “Fictive Portraits” at Manifest Gallery. There is a little “back room” at Manifest Art Gallery where twice, now, I’ve discovered unexpected excellence. It portends even more visits working back to front in this unusual art venue. 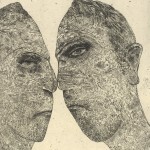 This latest surprise was a show of large hand printed portrait etchings on chine colle by Dennis Olsen. Chine colle adds a layer of mystery to the prints via thin layers of delicate paper, certainly not required since the portraits themselves offer great impetus to thoughtful exploration. 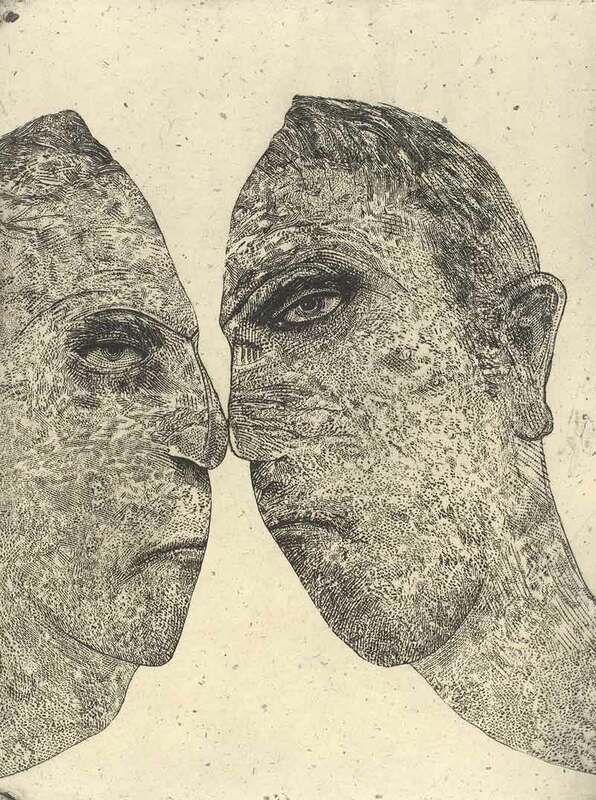 Aquatint was not perceptible in”Fictive Portraits”. All modeling, shadowing, depths and pattern are carefully placed marks, many of which make mini-abstract images able to stand on their own. Think Chuck Close. Complicated groups of marks form patterns in jewelry, hair, cloth: all delicately worked as a foil for the grotesque visages. Indeed, these faces resemble nothing so much as the grotesques so fancied by Roman emperors, chosen to decorate the walls of grottos where orgies were held, and these, too, are fictional. The artist often became so involved with them that he added short narratives suggesting the “real” person depicted. These “Flash Fictions” motivated viewers to linger longer, glancing back and forth between the script and image . 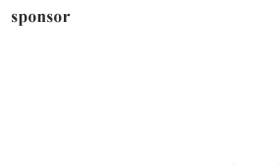 They are, in fact, published as “Blurbs” in “Fictive Images from a Timeless Village”, available at http://www.blurb.com/books/320832. Within the “Village” are all of the usual suspects from ancient fairy tales. There is the troll, more frightening in his threatening oversized features and tiny, piercing eyes than the Grimm brothers could have created in print. Here, as in all of these, the eyes are hypnotic, mesmerizing in their numbers and arrangements Often they do not match, or even resemble each other. They rise in pairs on a single outrageous face or appear inverted in another almost otherwise normal individual. Very little emotion is shown in the pieces. The emotion is all provided by the beholder. These “villagers” do not exist, but the profusion of eyes cast a spell of impossible belief. One very simply rendered man, “Sampling: Tristan”, relies, with smiling serenity, upon the motion of his long beard, swinging diagonally across the surface rendered only as dashes of etched marks, making this probably the least complicated of all the portraits. In others, heads are reproduced – – worn upside down – – balanced on top of another head, each with its own compelling eyes. 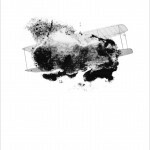 Another, “Sampling: Wilbur,” was a whirlwind of marks shaking the head, hair flying with action, and multiple eyes blurry with speed, yet focused. Heads may float unconcernedly above their necks, but never remove their gaze from that of the bewildered gallery-goer. The first gallery was a tribute to the art of motion produced by digital or mechanical means. 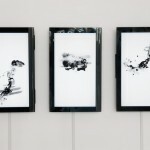 Contrast between these electronic creations and the man-made etchings made the exhibits seem worlds apart. It seems even the wind can now paint in hot, dramatic reds and yellows through mankind’s latest gadgets, as seen in Mark Nystrom’s “Winds/ June 3, 2009/ Long Island City, N.Y.” Profiles change as a thick, indented disc turns to provide changing profiles as shadows; a modern, moving extension of a 1528 set of variations of the human face drawn by Albrecht Durer and produced here by Pablo Garcia. 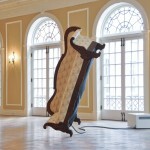 And a curlicued Victorian couch balances precariously on one leg, “musing on the stability of the social structures we build.” states the artist , Jacob Tonski. I must admit such an all-encompassing philosophy of modern life would not have occurred to me on my own. Many of these pieces rely heavily on the artists’ written interpretations, leaving their simple visual conceptions a bit confusing to the average visitor. Backlit glass plate photos of the Wright brothers’ world-changing flying machine in progress truly did not require explanation. Plainly the effects of black and white smoke trailing from the exhausts of bi-planes were as strangely patterned as any abstract painting. The effect resulted from the damaged plates stored in a shed in Dayton Ohio, and scarred by the flood of 1913. 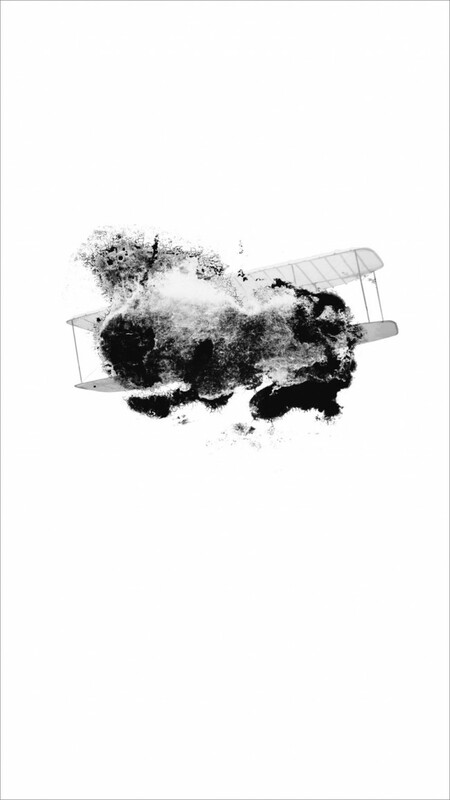 By digital manipulation, the artist, Kate Shannon, rendered the smoke and the planes swaying through space dramatically in a white background. “Kinetica [movement in art]” was well accomplished, arousing my curiosity, but “Fictive Portraits” captured my imagination.